A mother convicted of killing two of her babies should be freed on bail, the Attorney General has said. 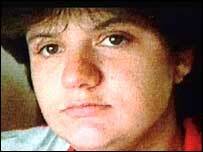 Donna Anthony, from Yeovil, was jailed in 1998 for murdering her 11-month-old daughter and four-month-old son in separate incidents. But Lord Goldsmith, speaking to Channel 4 News, admitted he had no power to overturn her conviction or grant bail. George Hawkes, Anthony's solicitor, told the BBC: "She was positively bubbly [on hearing Lord Goldsmith's comments]. "She really thinks something will happen." Anthony's case was referred to the Criminal Case Review Commission (CCRC) in September 2003, following an unsuccessful appeal in 2000. In 2004, the Attorney General announced a review of 297 cases following a judgment in the Angela Cannings case, with a 28 referred to the CCRC following the quashing of Ms Cannings' conviction. A spokesman for the CCRC told the BBC: "The only people who have the power to grant bail are the courts. "They can only do this if there is a due process going on, which there would be if we referred Anthony's case to the Court of Appeal. "The Attorney General's comments are helpful, but we are doing the review, which is nearly complete and we will make a decision in due course." Lord Goldsmith told Channel 4 News: "I believe because this was a case as we see it of sudden infant death closely analogous to that in Angela Cannings's case, then it does seem to me to be a case where there ought to be bail. "I can't myself overturn their conviction, I can't myself grant them bail. What I can do is speed them on their way which is what I attempted to do by notifying the defence representatives."